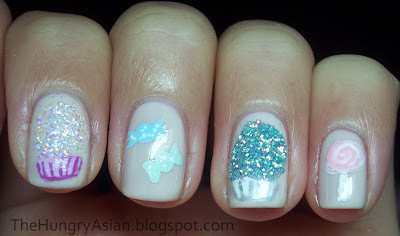 Home » guest post » nail art » Happy Birthday Jessa! A lovely young lady by the name of Jessa contacted me recently asking me if I would like some nail art ideas. Of course! After exchanging some emails I discovered she is very talented. Today is her 12th birthday! I have recreated one of the looks Jessa sent to me. 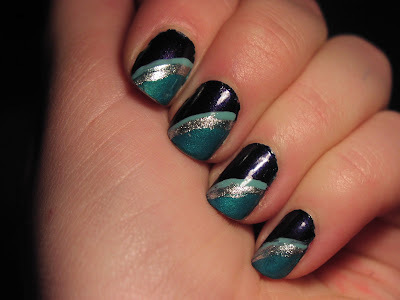 Jessa's striped mani. She used Sally Hansen base coat, OPI Russian Navy and China Glaze Turned Up Turquoise. For the stripes she used Sally Hansen Celeb City and China Glaze For Audrey. Isn't this cute? I love it! I changed up the colors a bit, for mine I used Color Club Where's The Soiree? as the black base. China Glaze Ruby Pumps on the tip, Color Club Wonderland for the silver glitter stripe and Art Deco white. Thank you Jessa so much for your creative ideas! I did a birthday mani just for you! The pale base is OPI Sweet Heart. I made some huge cupcakes by putting a glob of clear nail polish and dipping my nail into glitter. I then painted the rest with acrylic paint. There's a lollipop and some wrapped candies. I put a top coat over my index finger not knowing what was going to happen. The lovely texture of the cupcake glitter was taken away so my ring finger I just put TC over the paper cup part! I love Food Network and sometimes they show specialty cupcake stores and they always make cupcakes piled sky high with frosting. I really wanted to try one of those, why not wear it too? I hope you have a wonderful birthday Jessa! Happy birthday Jessa, you really are a talented young lady! 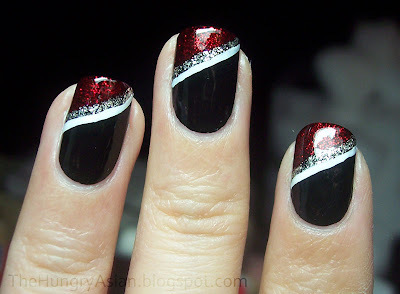 I just love the bairthday mani and I absolutely adore your striped look...CG Ruby Pumps looks to die for on the tip! Happy Birthday Jessa!!! I love both versions of the striped mani!!! I love the stiped mani! Jessa is one of my best friends, and I must say, she is really talented! Wow, these are so pretty! How do you make the stripe so tidy? whoa! I wish I had those skills when I was that age! Happy B-day to you & keep painting! I love Jessa's striped manis,and the application is beautifully done. 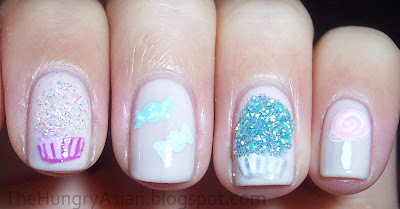 I also love your cupcakes on your mani...yum...now you've got me wanting a snack...lol! That is one talented lady. Very pretty manicures. I don't have idea for nail art unless I look on the blogs. I can never get beyond the nail color. It always looks so pretty. Those cupcakes with all that frosting look yummy but I don't eat all of that. I never had one with that amount either. Red Velvet with cream cheese frosting might do it for me. Love your birthday manicure. Sweet in more than one way. love the first mani, its so cute! !